Using cards, and in particular debit cards, which do not have the same automatic protection guarantees, brings with it a number of risks in today's consumer world where we trade ease of payment against security. While we are usually happy to use our debit cards for payments with those brands we trust (supermarkets and stores), many of us still prefer to use cash for smaller payments when we’re out and about. 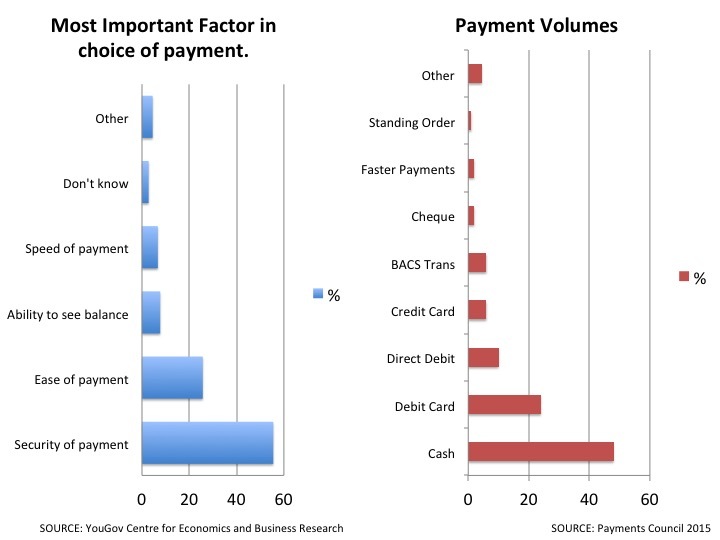 Indeed, the Payments Council say that 48% of consumer and business payment volumes are in cash compared to 24% by debit card and 6% by credit cards. According to YouGov, 55% of people place security of payment and data at the top of their priority list while only 26% place ease of payment at the top of theirs. In small amounts, cash is still easier to manage. Generally speaking, we no longer carry chequebooks and rely on cash (from machines) and cards. If you need more cash you just draw some out and manage your spending as you go. We all ensure that a secure lock and VeriSign site is used for online shopping, or we should. If you lose your card or payment fails on a scamming site you can phone your bank and cancel your debit card - but for 2-3 days, without a chequebook, cash or card, what can you do for payments? Currently in the UK, while retailers are happy to accept a debit card, life without one means that you need some cash! This impacts very heavily on the younger generations who are very familiar with card systems and used to life with little or no cash. Using a Credit Card is costly in terms of interest (payable immediately on cash withdrawals) can often carry a retailer charge for small bills and may also have a negative impact on your credit rating (which you probably don’t realise until you want a loan). To avoid using credit, you can go to a branch of your bank and, provided you know a great deal of bank and security questions off the top of your head, they'll give you some cash. While inconvenient and stressful, banks realise that they're not always open and want to help. With some banks, you can get ‘emergency cash’ sent as a code to your phone and this code will provide you with some cash when you go to the bank’s cash machines - this is a really good idea but…. though not so great for a bank! People who have done this once or twice quite often try codes randomly to try to gain cash from machines during a night out - each failed attempt costs the parent bank money and could undermine the willingness of banks to continue to provide these services. Convenience vs Security - We can devise some simple and easy ways to ensure that you have a means of payment which is acceptable to retailers or to help you get cash. 2015 is seen as the watershed year for new and cheaper payments systems and people suggest that the desire for easier of payment may overtake the security concerns of consumers. Therefore, the future solution should be the phone, the card, the bank and the retailer working together and enabled by a modern banking IT platform built for speed, accuracy and security. We think that the use of smartphone technology should open the door to easier banking, better customer service and consumer protection. So the future for mobile banking? Keep reading this blog. Please do the survey.